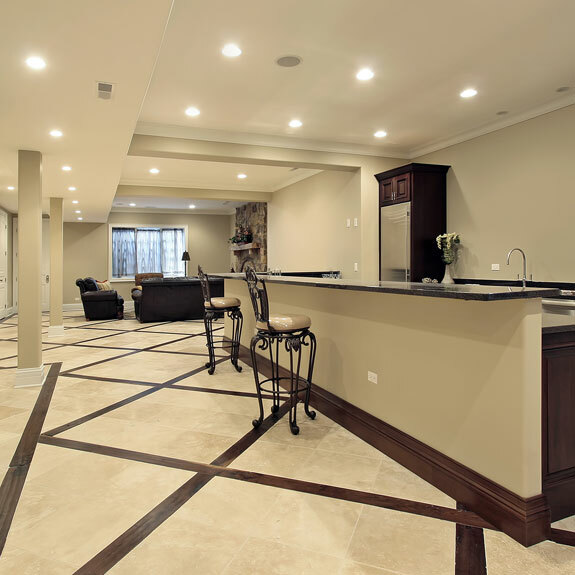 You want the expanded living space of a finished basement but choosing the right floor system for your basement is a challenge. Carpet doesn’t last very long in ideal conditions but in a basement, it can quickly take on a musty aroma and become water-damaged. Laminate and engineered hardwood can last longer but they are also susceptible to damage from moisture and even humidity in the basement. Basement epoxy floors in Fort Wayne solve these problems and more. Basement epoxy can last decades, transforming your basement from boring, dark, and musty to bright, clean, and beautiful in just a couple of days. Here’s how a basement epoxy coating really works and why it’s the best choice to give your basement the makeover you’re dreaming of. Learn more about the benefits of Epoxy Basement Flooring, then CONTACT US for a FREE ESTIMATE. A basement has the potential to be bright clean living space but it can also be little more than a damp, chilly, and dark subterranean area. Which best describes your basement? Give us a call to get the basement of your dreams with a professional basement epoxy coating. An epoxy basement floor in Fort Wayne, IN is a unique liquid-applied flooring product that offers industrial-grade durability with a highly decorative and durable surface at a price you can afford. Epoxy flooring is made from a mixture of resin and hardeners that have a chemical reaction when combined to bond with your prepared concrete surface and form a very hard plastic material. Once cured, basement epoxy can withstand almost anything. Chemical spills, moisture, pets, heavy dropped objects — all are resisted without leaving stains or damage on your beautiful new floors. Basement epoxy doesn’t just look great; it also protects your concrete floor from damage, stains, and moisture while creating a waterproof barrier to stop moisture from seeping into your basement. 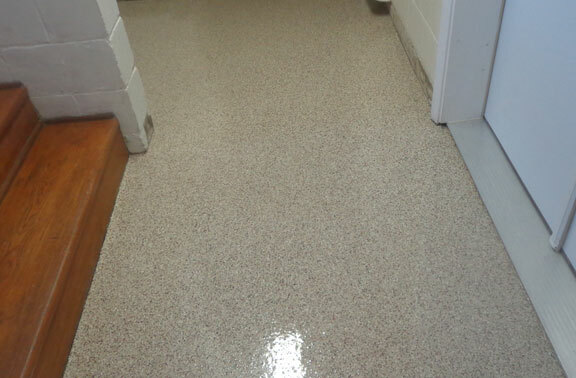 Few floor systems offer the practical benefits as an epoxy basement flooring. Is your basement adding real value to your home or is it little more than musty storage space? At Epoxy Flooring Fort Wayne, we can help you unlock your basement’s potential. Your basement has a lot to offer. It’s probably spacious with a comfortable temperature year-round. Unfortunately, basements are prone to moisture problems because they are below the surface. Without addressing this moisture concern with a proper waterproof barrier, your basement may be little more than a dark, dusty, and musty cave for storage. With a basement epoxy floor coating in Fort Wayne, IN, you can transform your basement into the bright, clean, and waterproof living space you’ve always wanted. Imagine a colorful playroom for the kids, living space for guests, the ultimate man cave, or a cool place to entertain. Epoxy basement flooring effectively stops the cycle of heavy rain, damp basements, and flooring replacement for good. Basement epoxy isn’t just a regular floor system; it actually stops moisture problems by preventing water from seeping up through your foundation. It won’t even be damaged if your basement ever floods or suffers water damage. Don’t let your basement go to waste. With a cost-effective basement concrete floor epoxy product, your basement can become anything you want, from a bright fitness room to a comfortable lounge for the entire family. An epoxy floor covering for a basement is different than carpet, laminate, engineered wood, or any other floor system you may consider for your basement because it’s also a waterproofing system that can resist water damage and stop moisture from seeping up through your concrete. We install only high-grade 100% solids epoxy products for long-lasting performance you can count on. Basement epoxy can brighten your basement floor by up to 300% thanks to its reflective surface. This makes your dark basement feel like bright, open living space. Fort Wayne is more durable. A basement floor epoxy coating in Fort Wayne is more durable than you may think. It bonds with the concrete and resists abrasion, chemicals, water, pet accidents, and much more. Epoxy flooring is an incredibly cost-effective solution. It offers a low installation cost and a long life of up to 20-25 years. It maintains its beautiful appearance for years to come for a great return on your investment. It’s the most practical solution for a basement. Don’t waste your money on flooring that will only become stained, scratched, or water-damaged within a few years. Epoxy withstands all of the hazards of a basement for decades without showing wear. You can get the look you want with endless design choices. You can choose something very simple like a single color or checkerboard pattern, get the look of granite with flake epoxy, or get a dramatic look with metallic basement epoxy.